Tiny settlement on the route to the New South Wales ski fields. Tiny settlement on the Monaro Highway, 54 km south of Canberra and 340 km south of Sydney, on the main route from Sydney to the Snowy Mountains. Now little more than a few houses and a motel it is a cold and isolated location which was first settled in the 1820s when an ex-convict couple, Emmanuel and Catherine Elliot, took up land at the edge of the official limits of settlement. 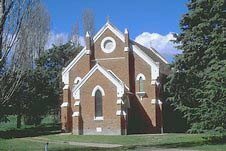 By the 1830s there was a sly grog shop and a short time later it became a stopping point for the mail which was passing through to Cooma and Bunyan. By the 1860s settlers had arrived in sufficient numbers to lead to the establishment of a police station (with a lockup), the Hiberian Inn, a store, post office and two churches. In 1866 the Clarke bushranger gang which operated in the area arrived in town, stole supplies from the store and got drunk in the pub, before heading off. They were captured a year later. The railway arrived in 1887. Today the town is a small stopover point on the main route to the Snowy Mountains ski fields.